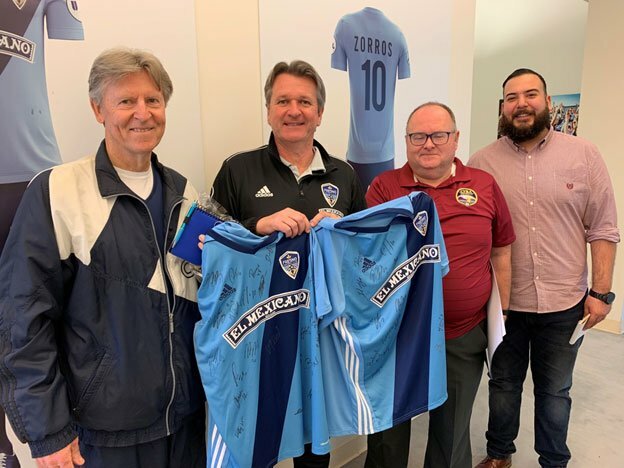 I had the pleasure of sitting down with Fresno Football Clubs General Manager Frank Yallop in his office on Monday after the Clubs record attendance home Opener. Yallop, if you’re not familiar is a former MLS legendary coach winning championsihps with both LA Galaxy and San Jose Earthqueakes. Cocaching the likes of Landon Donovan, David Beckham, and Chris Wondoloski to name a few. He has also played with Ipsiwch (Former EPL) as well as Candadas mens National Team. I was able to ask him some questions about his coaching careeer. Was there a certain player throughout your career that stands out as your favorite player to coach? Frank: I had an 18-year-old named Landon Donovan. Wonderful to coach, listened, was so talented, but wanted to work hard. Took criticism in the right way, and it wasn’t criticism, it was more my views on the game, and how I wanted him to play. He was just a joy to work with. When did you realize that soccer is what you wanted to do forever? Is there a coach that stands out to you in your career that you would consider your favorite? Frank: I had a bunch of coaches that stood out to me and were influential in my life. Bobby Robson who was the manager of Ipswich back when I signed in 1980. His reserve coach Charlie Woods, Booby Ferguson, and Brian Owen were all coaches that touched my player career and my life in a certain way and I will never forget that. They taught me how to be a young man and taught me not to worry about stuff like – if you’re not playing well don’t worry about it you just got to keep on the path. Also, to not let outside influences change what you’re doing. I owe a lot to those guys. What tips would you give to youth coaches? Frank: My big thing is that I never get angry with a player if they can’t figure out what you’re saying. Your information going to them sometimes players get it and sometimes they don’t. So, don’t get mad if they don’t pick it up straight away. I never get mad at my players I just continue the same path of saying the same thing over and over and suddenly, they get it and that’s such a joy. I used to coach teams saying, “were going to play a 4-4-2 and do this this and this”. The first few games it might now work, but then suddenly there’s the beautiful picture that I have been working on everyone is getting it, and everyone is working to the same drum. Coaching is not easy people think “Oh I can do that.” You have to manage personalities, systems, and individuals. Lots of things go into it, but the big thing is you can never get mad or frustrated. You have to think “It’s frustrating, but how can I change it? How can I help my players?” That’s all I have ever done. What message do you have for a kid who wants to pursue soccer as a career? Frank: My dad always said to me give 100% on everything. If it’s an easy game, why take it easy on them? Always try to better yourself in every aspect of the game. Also, you need to push your limits and make your ceiling go higher. If you don’t ever test yourself, you’ll never know if you’re any good. If you’re just beating the other team and it’s an easy game think to yourself “I want to score 6 goals in this game” Because that tests me. Just keep testing yourself. Keep striving to be better. You can keep improving always. When your coaches tell you to do something go out and do it. My first coach said to me “You have to be able to learn to get the ball from right back and you have to be able to chip it into this area.’. Guess what I did? Every afternoon for six months I practiced that on my own. When everyone went home I would go back to the training ground and got 50 balls and practiced my chip. I eventually got it. This was Bobby Robson and he’s the greatest manager England has ever seen so if he’s telling me to do it I am doing it.